The poem, entitled “Binangkal, Penelope,” was written in Cebuano by Corazon Almerino. 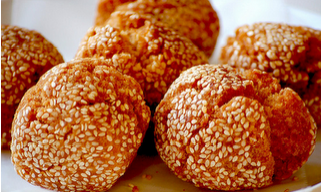 Binangkal, by the way, is a fried doughnut wrapped in sesame seeds and eaten as snack. Since the poem uplifted my spirit by making me laugh, I will post it here along with my translation in the English language. Og tultol sa iyang panimalay. Moluto, hala, pagluto og daghan. can’t find his way home. many places. Many also clung to him. cook, then make plenty of them. I know it’s a bit weird that I laughed over this poem when I should have shed Binangkal tears, but this is me. I had also laughed at some pages of One Hundred Years of Solitude by Gabriel Garcia Marquez when friends who have read them cried. And when the sadness had quelled after Sirius‘s death in the Order of the Phoenix and Harry was calmly looking at a mirror which was given by Sirius, I was sobbing uncontrollably thinking how stupid Harry had been. If he had just remembered the mirror and used it to communicate to him, then Sirius wouldn’t have died. What’s more, he didn’t realize this mistake. I hope, though, that the day will not come when I would cry over this poem. I don’t want to suffer the fate of Penelope, waiting for a wandering invertebrate. On the hindsight, it’s the general message of this poem that had uplifted me. It says one shouldn’t waste time and energy dwelling on things beyond their control. This statement, mentioned in a teleserye last night, also encapsulates the message of the Binangkal poem. Ah, life could be compassionate sometimes.